A new countertop can completely change the look of your kitchen. Although there is help available and you can get someone to do it for you, installing a countertop can be a DIY project that you can do yourself. Just follow the instructions below. Step 1: The first thing to do is to remove your old countertop and set it aside. Get it out of the way of your workspace while you build the countertop. Remove the sink brackets and keep the sink aside in the corner of the room. You will need them in sight at the time of reattachment. Step 2: Turn off anything that could get in the way. Turn off the electricity while you are working. Don’t forget to disconnect the water connection. You can turn both of these back on once you are done with your work. Step 3: Place the countertop over the cabinet and stick a masking tape along the edge to mark out the length. Mark this length on the other side with a pencil and double check the measurements. Once this is done, cut the countertop to the length of the cabinet. Use a file if there are any rough spots to finish up. Step 4: This is the time to attach build-up strips if needed. You will have to check if the countertop is blocking your cabinet drawers. If yes, then use build-up strips to lift up the countertop so the drawer space is cleared. Attach the build-up strips with nails at the back of the countertop leaving two-inch gaps. Check if the fit attaches well. Step 5: Next, use the masking tape once again to mark out the edges of the backsplash. Place the countertop on the cabinet against the wall. Once the countertop is set in place against the wall and the corner edges, tighten the miter bolts. Step 6: Draw out a line along the top of the backsplash with a compass and pencil. This will help trace the gap between the wall and the backsplash. This excess space can be removed with a belt sander by removing the countertop from the cabinet. File along the edges, place the countertop back on and check the fit. If everything looks okay, you can remove the masking tape. Step 7: Add backsplashes on the corner walls where the countertop and the wall meet. Clean up the look by adding end caps. Hold the end caps against the countertop and iron it down into place. Trim away any rough spots with a file. Step 8: Next, reattach your sink. 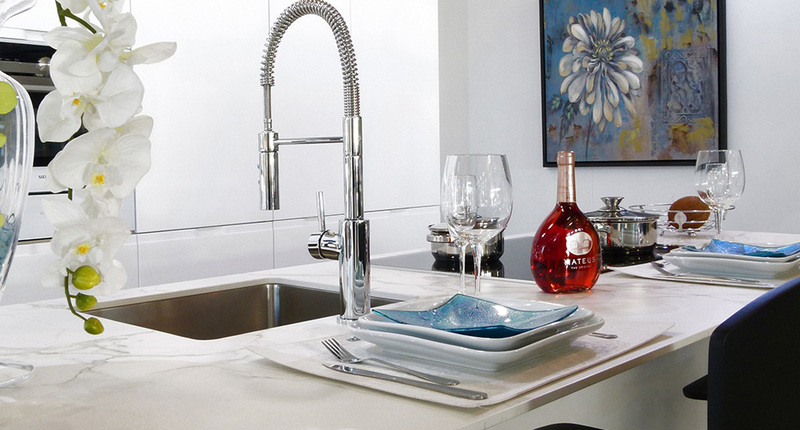 Most countertops may come with carved out space for the sink. If not, this is what you do – place your sink upside down and mark out the outline with a pencil. You will have to cut around a half inch into the traced outline. Place a masking tape to trace this out. Cut out along the traced masking tape. To help the cutting easier, first drill starter holes on all four sides and cut from one hole to another. Add some support along the edges of this cut and file the corners of the countertop. Use build-up strips to help increase support if needed. Step 9: Once this is done, attach the corner countertops with adhesive. Use a wooden piece to hammer down along countertop if the seam is uneven and wipe away excess adhesive. Make sure to tighten all the bolts before you move on to the next step. Step 10: Attach the sink to the countertop and add silicone along the edges. Also, add caulk (same color as the countertop) along the edge where the backsplash meets the wall. Step 11: Congratulations! You have installed your countertop. The final step is to admire your work!